Narrow Margin is a jazz-noir sextet featuring some of New York’s finest improvisors and lucid writing and arranging by yours truly. Produced by myself and John McNeil. Now this is just a terrific juxtaposition. Andrew Green weaves his tense and suspense-laden workout around the brooding jazz-noir of Bernard Herrmann’s theme from the film Taxi Driver. Thinking back to the nervous energy that was a major underpinning to the film, the association that developed between jazz after midnight and chilling violence was difficult to ignore and quite long-lasting. Green brings back those feelings, managing to amplify them along the way. The edgy, start & stop unison lines set up the vibe. A minute or so in, Bill McHenry’s sax enters in the call and response role. Tension builds until the main theme is introduced, which quickly gives way to a series of ascending rhythmic and melodic swells that pave the way for the appearance of “Taxi Driver” and the dark world of Travis Bickle. Subsequent transitions between Green’s work and the original theme become so natural that it’s easy to forget that Mr. Herrmann had no direct hand in this structure. Really great & evocative stuff. 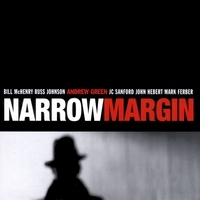 Narrow Margin is hard-edged music about hard-edged cinema and, like the best noir characters, the music packs a wallop. …Green’s compositions mostly stay sextet-size, but they’ve got all the stopping power of a blazing Tommy Gun. And the music was dark… dark like the shadows where most of the action happened. Andrew Green understands this, which is why Narrow Margin works like a Swiss pocket watch. Taking its title from the 1952 Richard Fleischer noir film, this often astonishingly memorable cd was written by guitarist Andrew Green while recuperating from a broken wrist. It’s simply one of the best jazz albums of the year. Talk about putting downtime to good use! It’s both a loving homage to noir soundtrack music as well as an intriguing update on the style. This is all about tension and mystery, and in keeping with the genre, JC Sanford’s trombone, John Hebert’s bass and Mark Ferber’s drums establish an ominous backdrop for Bill McHenry’s tenor sax and Russ Johnson’s trumpet while composer Green’s guitar plays the P.I. role, working every angle. The songs here – and they are songs in the purest sense of the word – can evoke a sense of dread, but often deviously: they’re stylized but not formulaic. As with a good noir movie, very little is as it seems. Drawing its inspiration from a 1952 film noir, Andrew Green’s Narrow Margin is a deep, creative work infused with delicious dread and danger…The result of the noir infusion is a set of eight pieces arranged with a sense of consistency and harmony in mind. Like fresh rain on dark pavement, Green’s compositions linger with thought and fragrance…Narrow Margin is a cool, slick record. Green’s compositions are elegantly balanced to give equal time and cadence to improv and sweetly arranged passages. Sometimes knowing a jazz group’s latest album before seeing them play from it is a complete waste of time. This time, it was like being handed a key to the secret back room where the party is always happening. A few years ago, guitarist Andrew Green spent some time on the disabled list with a busted wrist and he put the downtime to good use: he watched a lot of vintage film noir and wrote a lot of killer horn charts. The result was the album Narrow Margin (very favorably reviewed here recently), which is more of a homage to noir jazz from the 50s than it is an attempt to completely replicate the style. It’s full of mysterious twists and turns and catchy phrases, the kind of jazz album you find yourself humming as you walk down the street. And if you’re in the shadows, and it’s 4 AM and misty way over on the west side, all the better. Sunday night Green assembled most of the supporting cast who played on the album for a magical run through most of it. Joining Green were his albummates Russ Johnson on trumpet and JC Sanford on trombone plus Noah Preminger subbing on tenor for Bill McHenry, with an inspired rhythm section of Kermit Driscoll on bass and Mike Sarin on drums. A lot of the songs slunk along with a latin pulse, and they nailed it. Watching the songs – and they are songs in the purest sense of the word – take shape was an apt reminder how cleverly and ingeniously Green composed them. Trumpet and trombone would weave and bob around each other while Green worked variations on the theme, often with a bracing tinge of natural distortion. Preminger got the chance to establish plenty of contrast against the suspense and occasional outright menace of the rest of the band and did it with a stunningly nuanced attack and an unassailable calm: as good as McHenry sounded on the cd, Preminger took it to the next level. “Look, beautiful, I don’t care how you spend your time, but I’ve got a job to do, so take those gorgeous gams of yours and flake. And don’t call me. When I have an answer I’ll let you know.” She gave me that pouty little-girl look that had suckered Junior and gotten Short Willie killed but quickly saw it was no dice. Motivated by my entreaty—and the heater I was loading with hollow points—she turned and left the way she came in, hips swinging like DiMaggio. With little Miss Trouble out of the way, I got on the horn to the five-seven. My old pal Shaughnessy wasn’t around and neither was Falco. I knew from past experience that I would get bupkes from the desk sergeant (besides his opinion of my mother and various impossible anatomical suggestions), so I hung up and hit the pavement, heading for the West Side. It was getting dark by the time I reached the corner of Melbourne and Hicks, the usual place of business for Malcom Roswell. Known to friend and foe alike as “Spit,” Roswell was a small-time fence and full-time stoolie who would spill on Mother Teresa for the right price. How he managed to retain a physical presence on the planet was beyond a simple gumshoe like me, but this was one of those times in life I was grateful that some things didn’t make sense. Not seeing the canary of Collinwood, I found a recessed doorway nearby and settled in, figuring he was bound to show. After cooling my heels for an hour, the lease on the coffee and bourbon I’d had for lunch expired. Spit seemed to be a no-show, so I ducked into the alley behind Hicks street to pay my water bill. The alley had seemed deserted, but I thought I detected a shadowy movement in the evening fog. With the reassuring presence of a .45 auto in my shoulder holster, I crept forward along one graffiti-covered wall. As my eyes adjusted to the gloom, I discovered the source of the furtive movement—a furry, four-legged member of the order rodentia. He and several associates were busily tucking into the face and soft tissue of one recently deceased Malcom “Spit” Roswell. To avoid possible entanglements with the boys in blue, I departed the scene of metaphorical cannibalism with unseemly haste, and headed back to my office. Oh well, I told myself, look at the bright side, Blakey old boy: the world was becoming more rational by the minute.